Cira Crowell (M.A. SCAD) is a photographer and artist whose work spans conceptual fine art, adventure, landscape, cultural studies, documentary and humanitarian themes. 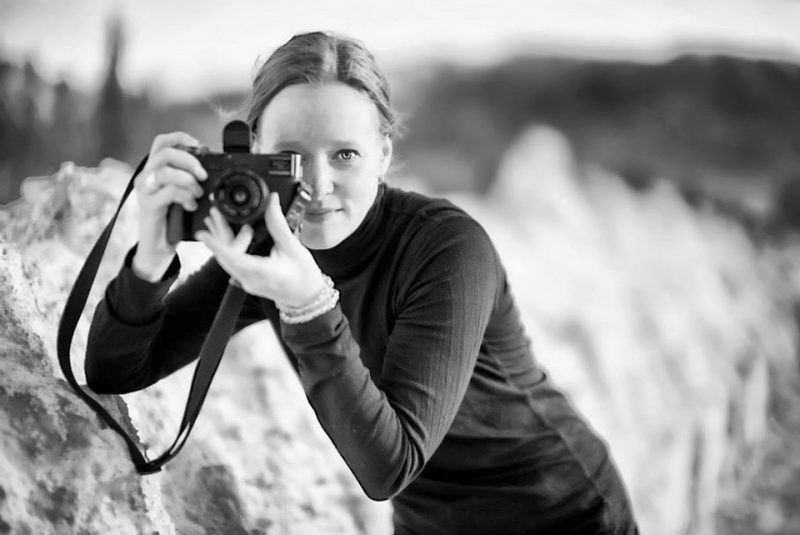 Her passion for black and white photography began twenty-five years ago with her grandfather’s Leicaflex SL2 film camera and she still uses many of the same forty-year-old lenses in her digital current work. Cira’s highly refined conceptual aesthetic transcends the boundaries between inner vision and the visible world. Detailed illustrations of inner light are the core of Crowell’s work and provide inspiration for her 3D motion graphic animations. Projecting illustrations brings them into the visible world in the form of minimalist “lumenography” in the studio and lush “lumengrafitti” on the streets from Iceland to India. 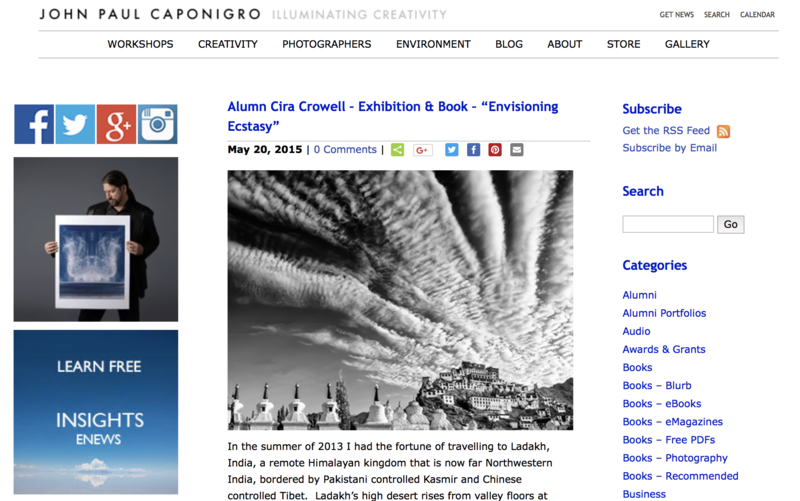 Cira travels the world capturing evocative incidents of life and light to share in books, shows, talks and online. She has trekked over 800 miles in the Himalayas from 8,000 to 18,000 feet (800 km from 2,500-5,500m). Her journeys include Nepal, Bhutan, India, Japan, Germany, and Iceland. 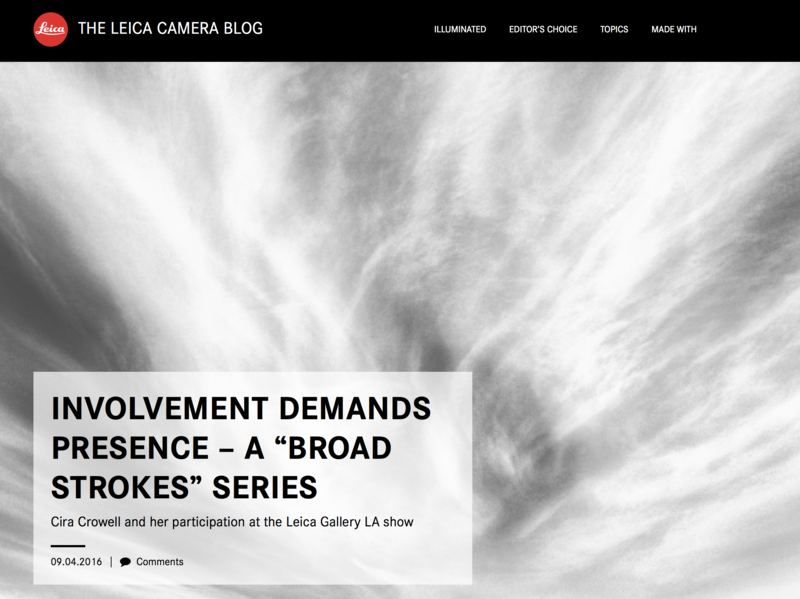 Recent shows combining Cira’s photography, new media drawings, and projected animations include “Luminous Everest” for Mountainfilm Savannah on Tour, “InLight” at Robert Berman Gallery, Santa Monica and “Envisioning Ecstasy” at Tibet House: US, New York and “Broad Strokes” at Leica Gallery LA. Her books, Beautiful Resilience: The Enduring Spirit of Upper Gorkha Nepal, Envisioning Ecstasy, and 108 Visions: Ladakh During the Kalachakra have been used to raise awareness, supporting a number of humanitarian projects including Nomads Clinic and Tibet House US and Little Suns. Cira lives and creates in Los Angeles, Santa Fe and beyond. ONLY A FEW SPACES LEFT! Click here to join us. Event: An Evening at IbuMovement Charleston: Sharing stories of friendship and photography in the Himalayas, read more here. 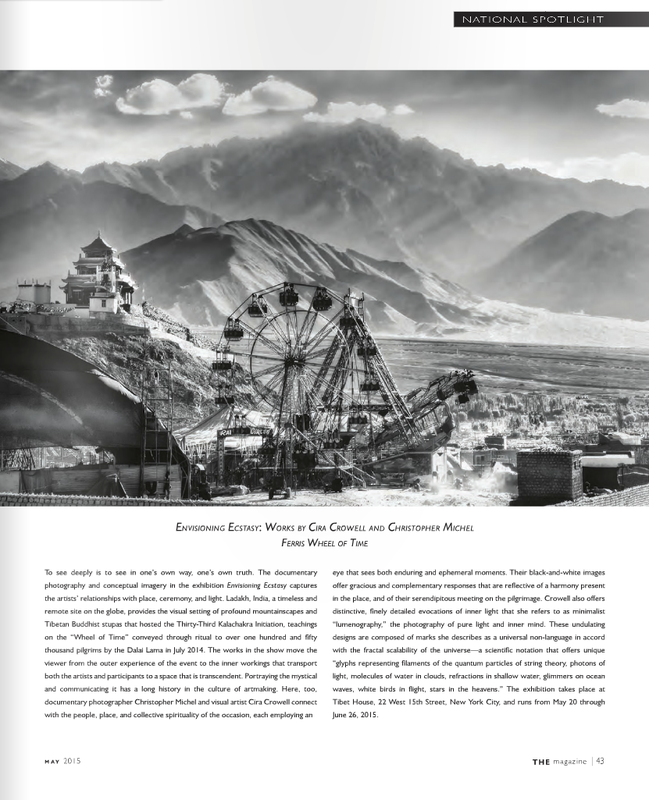 Book Release: “Luminous Everest” A hand-bound special edition book of Everest images benefitting Mountainfilm On Tour/Savannah. 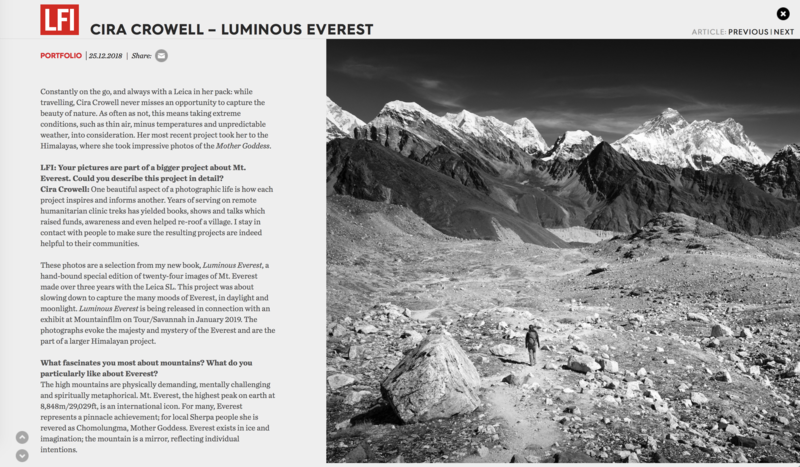 Leica Fotografie International Interview: Luminous Everest read it here. 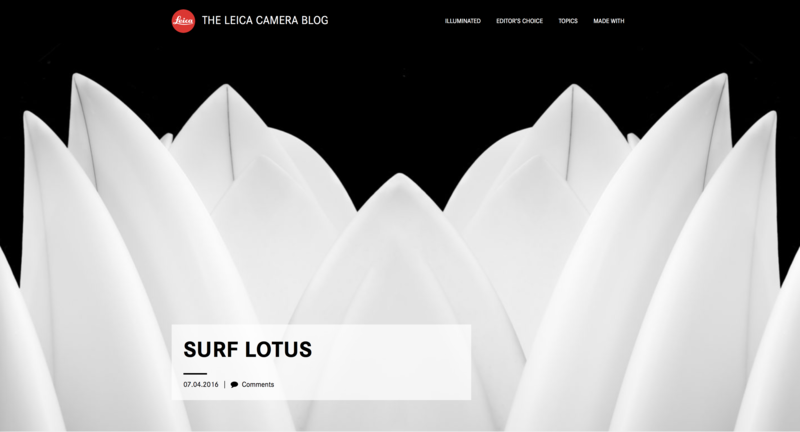 Images Featured on Leica Camera Leica SL website. 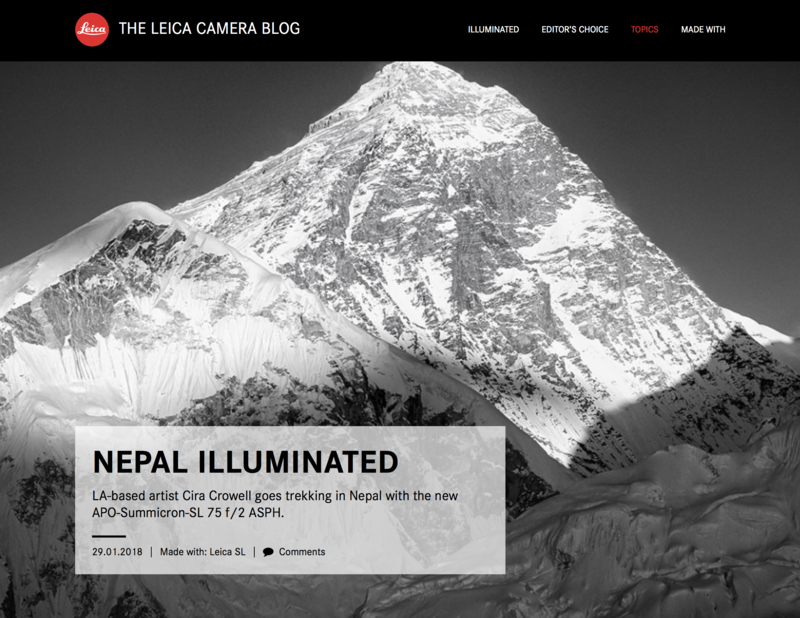 Interview: The Leica Camera Blog: Nepal Illuminated: read it here. 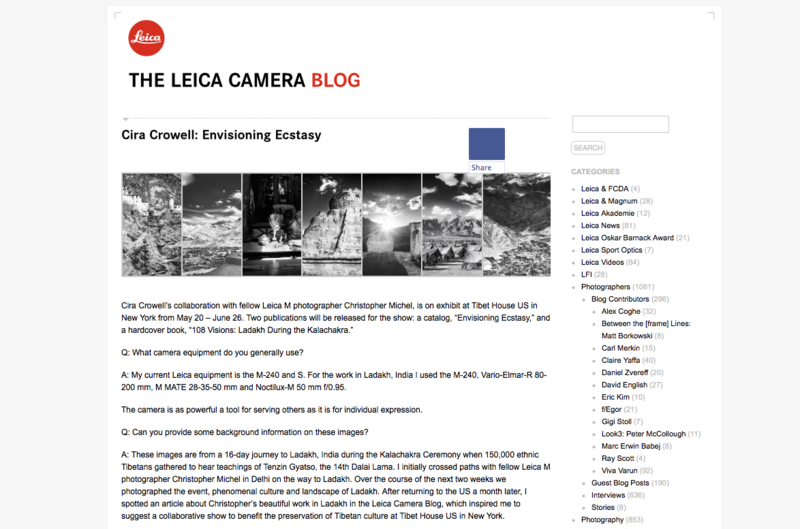 Leica Camera Blog Interview: read it here. 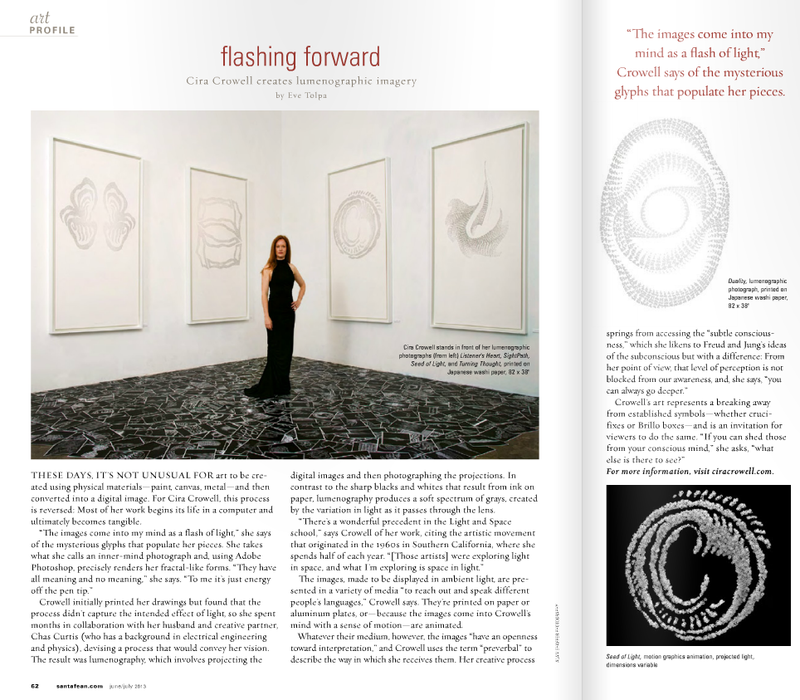 THE Magazine, Santa Fe, May, International Spotlight, page 43. 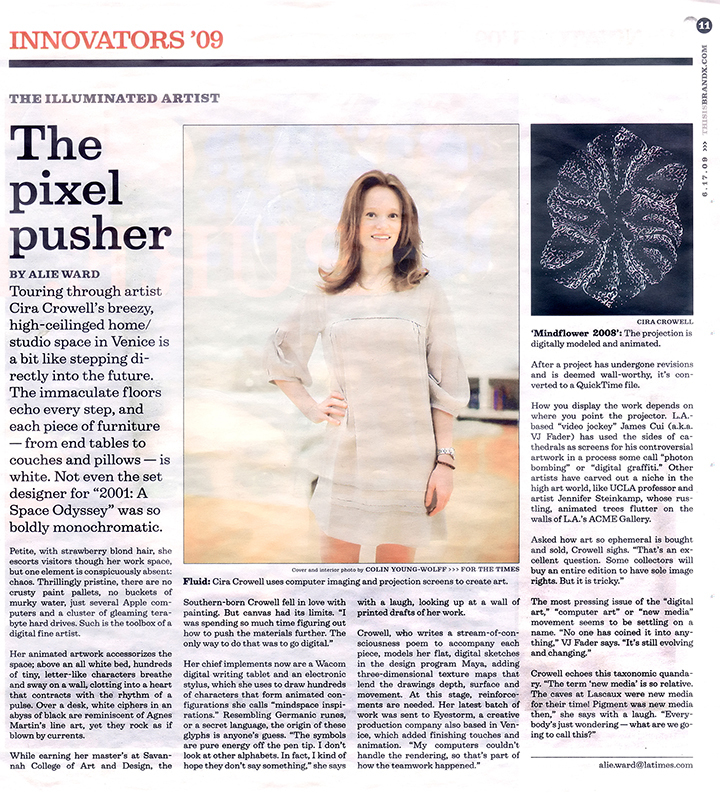 Huffington Post spotlight about In Light exhibit at the Robert Berman Gallery, 2012. A. Light is many things, from the physical to the spiritual to the symbolic. Visible light surrounds us every day, we rely on it to grow food and are only just beginning to harness it's energy. We are also surrounded by idioretinal or inner light, for examply in dreams. This mindspace light is so familiar we barely notice it. My life's work explores light in all it's degrees, from starlight to brightness of spirit... the infinite interconnections of light and life. Q. Why black and white? A. White equals Light and Energy. Black equals Space and Stillness. Q. What are the marks? A. The marks are a universal non-language in accord with the fractal scalability of the universe. They are meaning beyond meaning - all and no meaning. The glyphs represent many things - filaments of the quantum particles of String Theory, photons of light, molecules of water in clouds, refractions in shallow water, glimmers on ocean waves, white birds in flight, stars in the heavens... In symbolic terms they are both numeric and alphabetic, scientific notation and digital code. Occasionally words are embedded as inspiration strikes. The marks on each drawing and animation are unplanned and completely unique to that image. They are pure energy off the pen tip. Q. Why do you say the images are minimalist? A. The tools are irreducible and nothing is added to the original inspiration. I use the most basic, default 10 point mark in Photoshop. It is the equivalent of a digital yellow pencil. Nothing fancy. There is a lushness to less... From the aesthetic timeline of art history the images are an outgrowth of the work of Agnes Martin's grids, Jay DeFeo's monumental painting, The Rose, and the early charcoals of Georgia O'Keeffe. As an outgrowth, the work could begin to be categorized under the umbrella of neo-minimalism, http://en.wikipedia.org/wiki/Neo-minimalism. Q. Would you say the drawings are abstract? A. Definitely not. The drawings are very precise representations of mindspace inspirations, light in the subtle conscious. There is nothing accidental. The inspirations are quite clear and concrete and I draw directly from memory without embellishing or editing. I believe that we are only as conscious as we allow ourselves to be. It is a matter of learning to pay attention to deeper intuitions and images in the subtle-conscious mindspace. Q. These look fractal. Are they? A. They are scalable and directly reference everything from the microcosm to the macrocosm, from photons to constellations. Q. Why do you create poems, drawings, photographs and animations? A. People relate to different media. Usually the first inspiration is the drawing and I often don't know what it's about. While drawing, words arise and a simple poem forms in my mind. Studying the behavior of light through photography has a poignant relation to the work. The original inspirations move in my mind so the animations are active drawings. No other medium could capture the light and narrative motion. I have a regular drawing practice, producing about two new stills a week. Then I select images for animation and develop several new animations a year. Q. How are they related to science? A. The images are synchronistically related to science. I don't set out to create scientific illustrations. By their fractal nature all the images are related to chaos and complexity theories. A similar example of patterned scalability is http://www.ted.com/index.php/talks/george_smoot_on_the_design_of_the_universe.html. They are also illustrative of manifold geometry theorized in the 5th Dimension and higher of String Theory. An example of the behavior of manifold geometry is http://en.wikipedia.org/wiki/File:Calabi-yau7.gif. Q. How are they related to spirituality? A. Light has always been literally and figuratively related to the Sublime. From monotheism to transcendentalism, from East to West, ancient beliefs to metaphysics, Light is a remarkably universal fascination of humankind. Perhaps Light is our original, all-pervasive, transcending, timeless experience. Q. How does your fine art relate to your humanitarian work?